To expect different results, you need to do ministry differently. God put a passion in my heart for helping organizations get unstuck. Even from the early days, I’ve had a passion to help churches, specifically existing churches, to get healthy. All of my previous experience—my city manager days, included—has been working with communities and churches to help rebuild what is suffering and declining. I started The Unstuck Group because of this. I wanted to help leaders and churches find clarity and perspective that resulted in their ability to lead more people to Jesus. We’re 10 years in, and I’m still excited about what God is doing through The Unstuck Group. And, I’m re-energized by our most recent update to the process we use. Understandably, stuck churches want to get unstuck quickly. Honestly, I would be concerned if there was little urgency and excitement to fix what’s broken. But, the results are compromised when the emphasis is on the speed rather than the quality of the approach. To revitalize your church takes a significant investment—time, energy, resources and laser-focus. When you sit down with your team to answer these questions, it’s vital to not just prayerfully answer them, but to do so in order. Stuck churches jump to how to do the ministry, discipleship, weekend services, etc., instead of focusing on why we do those things. If you’ve done the hard work of answering the first two questions, you have to answer the how. It might sound obvious, but if you want to see change, how you do church in the future has to be different than what you’re doing today. That’s one of the most common things we see—stuck churches continue to do the same thing expecting different results.Subscribe to ChurchLeaders! One of the key factors that we find in stuck churches is that they are inwardly focused. It’s the natural pull. This is an extremely important shift—to move from being inwardly focused to becoming outwardly focused. As leaders, we always have to be reminding our congregation and refreshing our strategy to reach those outside the church and outside the faith. The churches that we’ve seen actually turn toward an outward focus are those that are answering the first two questions addressed earlier, “Why do we exist?” and “Where are we going?” You, the senior leader, have to be intentional about consistently bringing that vision forward. This image shows what I mean. I’ve written about this a lot because this is a theme I’ve seen in healthy, growing churches. 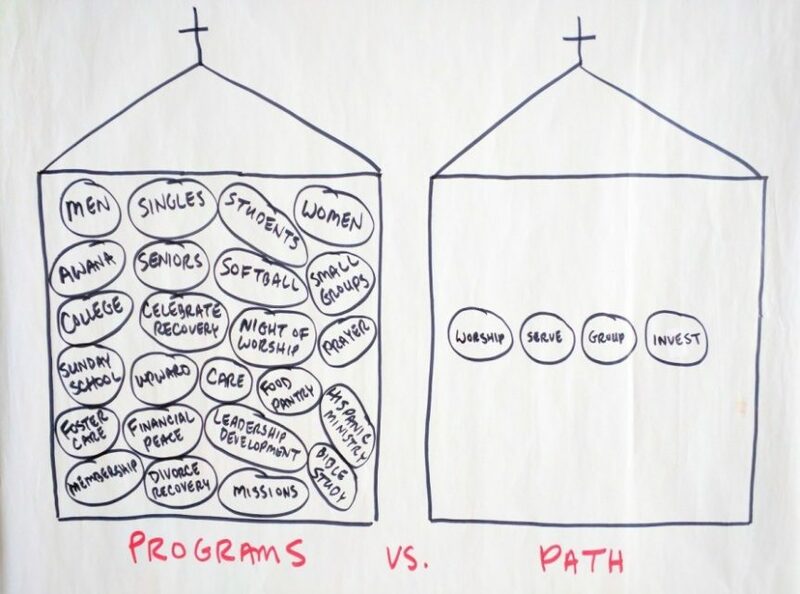 The ones experiencing the most healthy growth approach discipleship as a path instead of offering an overwhelming number of programs. Instead of ministries competing for time, attention and resources, a path simplifies how to lead people to Jesus. With events, programs and a lot of meetings, we lose sight of our mission, vision and focus because we’re doing too much doing. A complex ministry rarely helps people take next steps in discipleship. Complexity also makes your team feel like the “win” is just getting people to show up to meetings or events, instead of seeing real life change. I suggest reading Essentialism by Greg McKeown. It’s not written for church leaders, but try to read it through the lens of ministry strategy. I’ve suggested this to a lot of church leaders I’ve worked with, and I think it can bring strong focus around how you’re functioning as a team and as a church. A key indicator that churches are stuck is that people spend more time talking about how to do the ministry rather than doing it. Sitting in meetings won’t lead people to Christ. Equip and empower your lay leadership to be more engaged in the ministry of your church. We launched our new consulting process late last year, and I’m re-energized by what we’re doing. As you plan what this year looks like for your church, check our updated Unstuck Process. I really believe in what it can do for your church. Tony Morganhttp://theunstuckgroup.com/Tony is the Chief Strategic Officer and founder of The Unstuck Group. For 14 years, Tony served on the senior leadership teams at West Ridge Church (Dallas, GA), NewSpring Church (Anderson, SC) and Granger Community Church (Granger, IN). He’s written several books and articles that have been featured with the Willow Creek Association, Catalyst and Pastors.com. IT IS TIME TO DROP THAT UNNECESSARY SPIRITUAL WARFARE !